Heard some maniacal laughter earlier today, so I walked into the loft and found this face. Umm… What? Nah, I’m just standing here. I did NOT just lock a cat in the guinea pig cage then laugh hysterically. Not sure what the cat’s face is saying though. We have some patient cats. They’ve been impressively patient. I think they’ve only popped my girls once or twice. Only lightly and only when they were being sat on and having their whiskers yanked. They seem to get that these rampaging people are just babies. Aw, such well-behaved kitties! I think I’d get a little testy if I was sat on, too. Hopefully the guinea pig didn’t disappear?! 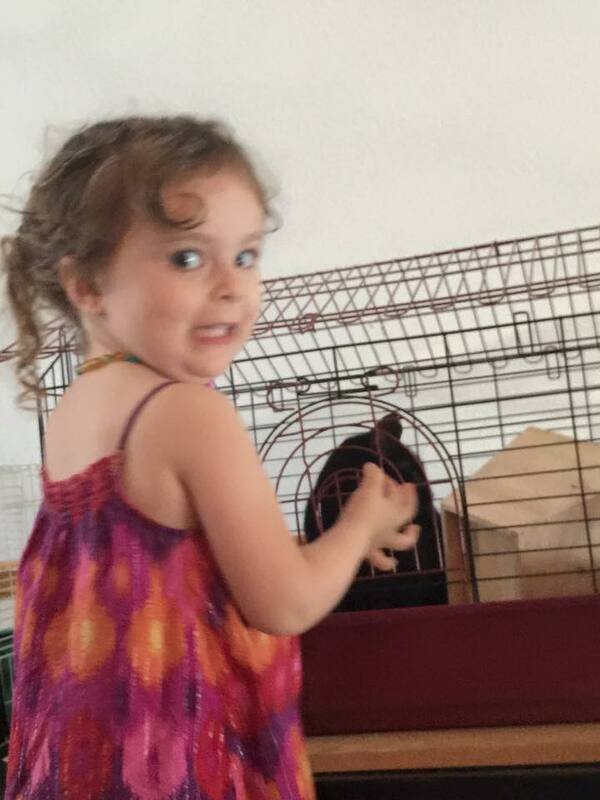 Thankfully I don’t like cats so we never had that problem with our kids when they were young, but my daughter did want a hamster so bad, but then she would never take care of it or hold it and one time she forgot to feed it and it died. We never told her about her not feeding it or she would have had guilt for that. Oh no! That was good of you– the guilt would probably not be worth the lesson. My wife thinks we should get a cat because it would keep the mice away, but I’m like, think of everything else. The cat food, the cat poop, the shedding. Just not worth it to me. Some cats do that. I had one growing up that was very skittish and you could barely touch her and she would try to scratch you. Bitter memories. But they work for some people and that’s okay. That’s too bad! I’ve always had friendly kitties, but I think they have to be tamed early. Past a certain point, they stay skittish. I think it had to do with the fact that she ran away for about 3 months, we thought she was dead, used up 8 of her lives and came back with some street knowledge. Anyways, she lived 20 years was deaf and blind at the end (was probably a 100 in cat years). That’s definitely a while in cat years… It’s nice she came back, though she sounds like she was a bit shell-shocked. They are definitely different creatures. Very unpredictable and you never know what you are going to get. That cage is far too small for a guinea pig.